Kenny Shiels Derry City manager. 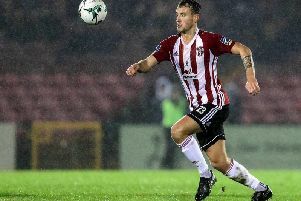 Derry City will be playing Friday night football this season. The ‘Candy Stripes’, who start their 2017 campaign at Bohemians on Friday February 24th, have decided to play home matches at their new home, Maginn Park, on Friday evenings. After originally planning to play games on Sunday afternoon, the club now feel switching back to Friday evenings is a better option however they are reverting back to Sunday later in the season. City’s first home match of the season against Limerick will now take place on Friday March 3rd and their home clash against Drogheda United, which was originally scheduled for St Patrick’s Day, has been put back 24 hours and will take place on Saturday March 18th (k.o. 5pm). “We want to do what is best for the club and our supporters,” stated boss Kenny Shiels. Shiels also confirmed he has a number of trialists coming in to take part in pre-season training, which will “step up” in intensity from tomorrow. “We have eight players coming in from all over. Through my contacts I have been able to get a few players on trial,” added Shiels. “I’m looking to get a versatile defender like Nico (Niclas Vemmelund) and someone who can replicate (Conor) McCormack’s ability to accept the ball in tight areas. Meanwhile City will mark the first anniversary of legendary striker Mark Farren’s death with a special match against the club’s all-time leading goalscorer’s home town side Greencastle next month. Shiels’ men take on Greencastle at Chapel Lane on Saturday February 4th (KO 2pm).